Controversial, unprofessional and effortless – the three qualities that make Micky P Kerr genuinely hilarious and an all-round pleasure to watch. He appeared from the back of the room, looking like a lost member of the mostly intoxicated crowd, then made his way on to stage. After a brief introduction, clarifying that he was an actual musician and not just a random guy with a guitar, he began. Micky P Kerr was gifted with being naturally charismatic and comical. He openly admits his lack of ability to remember his 10 second spoken word poems yet it doesn’t anger the crowd, it actually adds to the comedy. Micky P Kerr is the human embodiment of an ideal Sunday and that’s something a lot of the crowd can identify with. When he messes up his words for the fourth time we all just laugh along, safe in the knowledge that we’re here and not at home being forced to listen to Kanye West’s new album. Despite Micky’s ability to appear completely nonchalant and pass off just about anything as a joke, when he picks up his guitar and introduces the next song about his daughter, the passion is clear to see. His voice has a rustic edge to it which compliments his acoustic guitar. Surrounded by emotion and thoughtful lyrics his song echoes around the room proving that he’s not just a guy who tells jokes in his spare time; he’s a talented musician with a good sense of humour. Almost immediately after Micky left the stage Molly’s Lips took their place. The two young men travelled almost 300 miles from a small town in Kent named Deal and I was intrigued to see the talent we’ve been missing out on, up here in the North. Molly’s Lips completely entranced me with their calming rhythm. Their slow acoustic set encompassed the peaceful ideologies that Will Varley conveys, and brought a sincere level of peacefulness to the whole gig. Some of the audience swayed softly to the music whilst others remained completely still, quietly appreciating the young talent that stood before us. The pair had created a genuine relationship with the crowd through comedy and personal interaction. The pair made jokes about Will Varley and themselves, which personalised them and made the crowd feel instantly comfortable and interested in the talent they had to offer. It was amazing to see the crowd support them with cheers and calls to continue when the sound momentarily cut out. This response perfectly sums up the kind of community which has formed around Will Varley and his support acts. Molly’s Lips’ tranquil presence reminded me of indie/folk band, Phosphorescent, whilst their raw acoustic talent was comparable to folk/rock band The Lumineers. Overall their sound was refreshing, genuine and destined to take them far. It was then time for the headline act, Will Varley, to wow us with his unique set of satirical, political and emotional folk songs. Despite growing up in London, Will has a significant appeal to us Northerners; he combines comedy and serious issues in a way that a lot of people can relate to. Will’s set followed a much more serious tone than that of Micky P Kerr or Molly’s Lips yet in between poetic songs about the failure of our system, he revealed a personality similar to a giddy child. He told humorous anecdotes, showed support for the musicians that played before him and even light-heartedly heckled back at the crowd. Will proves that being a successful musician doesn’t mean you can no longer be original or unique – in fact he thrives on these qualities. His constant acoustic guitar sets a peaceful tone yet his powerful voice creates a meaningful and passionate atmosphere that appeals to an audience who want to connect. The lyrics he chooses become meaningful beyond words when voiced with the expression and talent he commits to. Listening to his music in the comfort of my own home is always thought- provoking and enjoyable but it was an honour (a feeling I felt was echoed by the entire crowd)to experience the man behind the lyrics, and his enthusiasm added a whole new level to the insightful music. 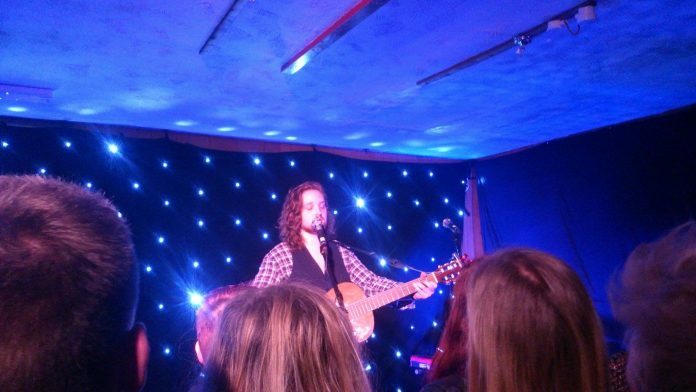 Despite his politically-based songs such as ‘We Don’t Believe You’ and ‘Send My Love to the System’, Will Varley also brings a comical aspect to his gigs with some of his older songs such as ‘Self-Checkout Shuffle’. The mood at these small gigs is always one of great unity and enjoyment; the musicians are genuine and the talent is real.